The KYB Group creates products gentle to both people and the earth. We are dedicated to the promotion of environmental activities as an important tool for evaluating management. 1. Coordinates and builds up productive and corporate activities based on the recycling to reduce impacts on the environment. 2. Strive to ensure long-term and sustainable operations throughout the entire KYB Group. 3. Work to promote harmony with society and contribute to the global community as a good corporate citizen. 4. Clarify every employee’s role so that all employees can participate fully. As of fiscal year 2017, the mid-term policy phase 3 will be developed, and we have started environment and safety activities based on the new mid-term policy formulated under the keywords: compliance with the rules, speed, and challenge. 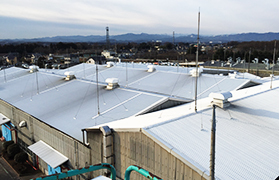 The Kumagaya Plant installed a heat shield coating on the roof of building No.1 in July 2016. After installation of the heat shield coating, the air-conditioning load was decreased and resulted in approximately a 7% per year reduction in CO2 emissions. In addition, the indoor temperature was decreased by 2 degrees C from the average per year. 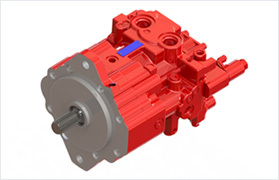 Contribute to excavator operability improvement and energy saving. 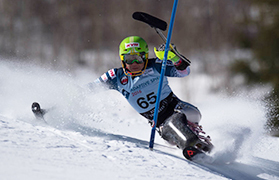 As a sponsor and supplier of the Para-alpine ski team of the Japan Para-Ski Federation (Specified Nonprofit Organization), the KYB Group develops products and provides technical support for the shock absorbers on the chair-skis for the Japanese team.